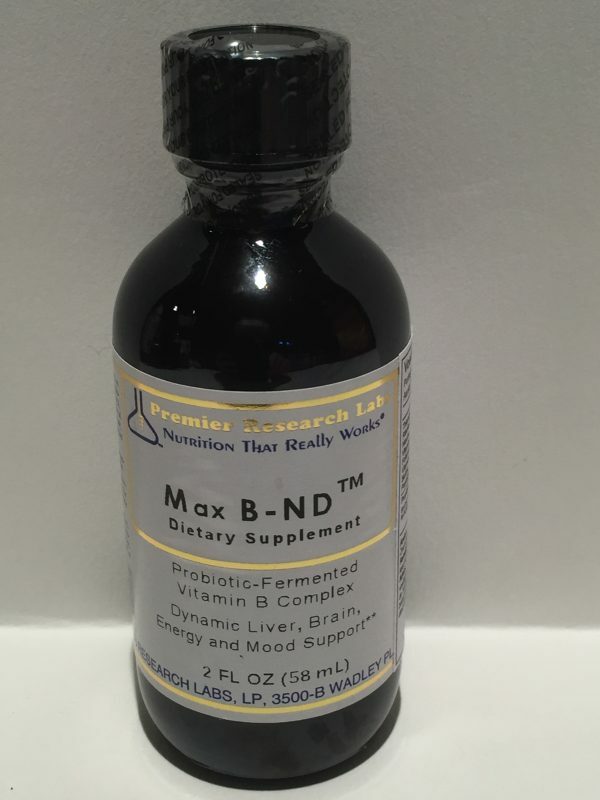 Max B-ND™ is op de eerste plaats een voedingssupplement – met probiotische culturen van B-vitaminen – zoals ze nog niet eerder beschikbaar waren. Het bevat een hoog-energetische, eind keten B-vitamine complex, afgeleid van levende bronnen ten gunste van eerste voedingswaarde resonantie. Iedere halve theelepepel bevat hoog-energetische, eind-keten vitamine B-vormen (de vorm die geschikt is voor opname) inclusief B6 zoals pyridoxaal-5-phosphaat, vitamine B5, foliumzuur en nog veel meer. Deze B-vitaminerijke formule biedt geavanceerde ondersteuning voor je lever, je energie, immuunsysteem, bijnieren en je stemmingsbalans. Onderzoek suggereert dat ‘levende’ vitamine B-bronnen de voorkeur hebben boven gewone synthetische, ‘kool-teer’ afgeleide bronnen. Onze premier-kwaliteits formule is verteerd op micronivo in extreem kleine bio beschikbare deeltjes; door middel van ons eigen fermentatieproces via gelijksoortige multistammen van probiotische coloniën. Dit zorgt voor een zeer snelle opname op celnivo en dynamiek op 4 polariteiten, zoals geen enkel ander product dat doet. Veel mensen voelen de eerste keer al het effect van dit product. Deze formule is houdbaar gemaakt met gecertificeerde biologische alcohol zonder gedetecteerde pesticiden en/of zware metaal residuen(via laboratorium testen). – s’ Werelds eerste natuurlijke-bronnen vitamine B, gemaakt via natuurlijk gecultiveerde probiotische fermentatie. – Internationale technologie (patent aangevraagd). Hoog-actieve, levende B-vitaminen in hun eind-keten vormen.Ze leveren een hoge cellulaire resonantie. – Andere B-vitaminen zij synthetisch en hebben geen cellulaire resonantie. – Onderzoek suggereert dat natuurlijke bronnen van B-vitaminen het meest veilig en meest effectief zijn, speciaal bij langdurig gebruik. 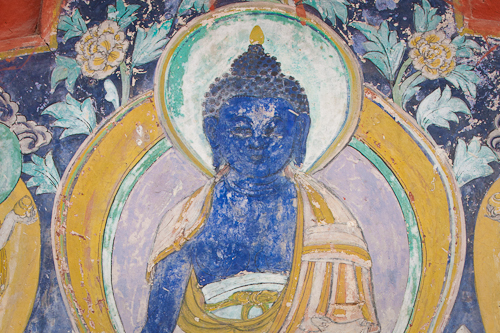 – Bereiken van een maximale stress- en breinondersteuning, anti-aging, hart, lever, stemmingsbalans en stofwisselingvreugde. – Natuurlijke bronnen van vitamine B laten de lever opnieuw stralen. 30 Druppels 2x per dag levert je het volle spectrum aan B-vitaminen, inclusief: B12, foliumzuur, choline, B6, B1, B3 ( niet in de flush-vorm). Het kan gebruikt worden in plaats van geisoleerd foliumzuur, vòòr en tijdens de zwangerschap. Je zult absoluut niet teleurgesteld zijn met de toegenomen energie die je zult voelen door dit exquisiete natuurlijke product! Now for the first time, completely natural-source B vitamins are available in Vitamin B Nano-Plex derived from proprietary technology using special, healthy probiotic strains. This means a Quantum Leap in everything that B vitamins do for the body – maximum stress protection, anti-aging, instantaneous energy boost, brain rejuvenation, heart health and mood balance. 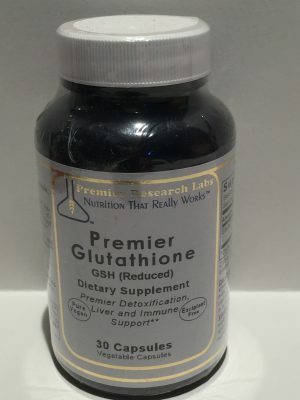 Because of its liquid oral delivery system, this is one product that literally everyone we know who tried it really felt an immediate difference — an instant feeling of well being and better mental clarity. No amount of synthetic B vitamins can deliver the super energy boost you’ll experience with just 1/2 teaspoon of Vitamin B Nano-Plex. This product nourishes the cell’s DNA, delivering a biophotonic “body of light” only found in “once-living source” nutrients. Synthetic B vitamins – and all synthetics for that matter – actually accelerate aging and degradation of the cell’s DNA. The whole B-complex family of vitamins — especially folic acid and vitamin B12 — are necessary for optimal health for you and your entire family. While they may not be as famous as vitamin C, the B vitamins — especially folate — are certainly making a name for themselves in the news these days. In fact, in 1998, the Food and Nutrition Board, the group within the National Academy of Sciences that sets the Recommended Dietary Allowances (RDAs), published revised RDAs, now called Dietary Reference Intakes (DRIs), for the B vitamins. The B vitamins work together as a team, which is why it is generally recommended to take a supplement with the whole vitamin B-complex family, rather than individual, isolated B vitamins. The whole B family is needed to help keep the body in balance and harmony for greater physical, emotional and mental health for you and your family. Even if you could eat large amounts of foods rich in B vitamins, such as fruits, vegetables and grains, you would still typically fall short of the desired daily intake of B vitamins. Why? Research shows that the nutrient content of our food has been drastically decreased due to poor soil health and extensive pesticide use in the U.S. So, one of the best ways to assure you’re getting enough B vitamins is to take a natural-source B-complex supplement such as Vitamin B Nano-Plex. The proven benefits associated with the B complex are actually created by the entire, intricate, complex symphony of phytonutrients and supportive co-factors naturally found only in whole nutrient sources, not in isolated, synthesized molecules. In short, test-tube vitamin B complex simply cannot re-create the magnificent synergy of a whole-nutrient vitamin B complex found in Max Stress B Nano-Plex. Let’s take at look at the whole “B” family — the B-complex and other B like vitamins — and why they need to be on your “A” list of “must-have” nutrients. Imagine eating 2 heads of lettuce, 3 apples, 5 bananas, and 7 carrots every day to try to get the minimum requirement of folate (400 micrograms). Even if you could eat large amounts of folate-rich foods, research shows that folic acid derived from food may be less readily assimilated and utilized than the end-chain form of folic acid as found in Max Stress B Nano-Plex. Women of child-bearing age are now being urged to increase their folic acid intake in order to help prevent neural tube defects in infants (which can cause brain and spinal defects) and spinabifida (where a segment of the spinal nerve cord grows outside the bony spinal column). In addition, adequate levels of folate have been associated with lower levels of homocysteine in the blood (a risk factor for serious heart and immune concerns). Vitamin B12 plays a key role in the body and is also associated with lower levels of homocysteine in the blood. It is required for energy production and overall health of the body, including red blood cell formation. 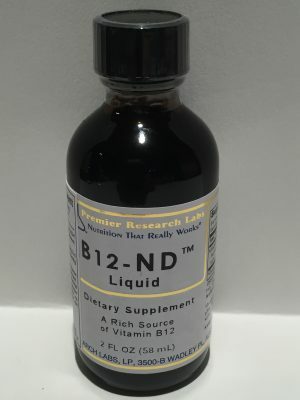 Other roles of B12 include proper nervous system development and prevention of infertility in men. It has also been shown to improve memory and promote heart health. 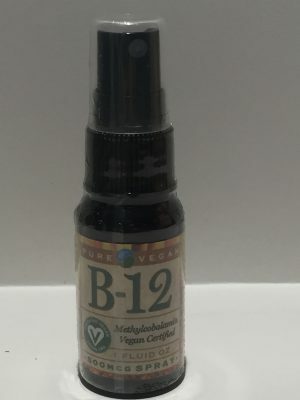 Lack of sufficient amounts of vitamin B12 can create a deficiency or absorption problems that can lead to pernicious anemia. Research has shown that vitamin B12 levels decline as we age. This may be due to poorer food choices, educed intake of B12 or poor absorption. Like folate and B12, vitamin B6 has also been associated with lower levels of homocysteine. In addition, vitamin B6 is well known in this computer age for its role in relieving carpal tunnel syndrome (CTS), the weakness, numbness, tingling, and pain in wrists and arms caused by repetitive motion. Those most susceptible to CTS include computer operators, supermarket checkers, production line assemblers, carpenters and seamstresses. In their book, “Vitamin B6 Therapy”, John Marion Ellis, M.D. and Jean Pamplin explain how B6 helps carpal tunnel syndrome: “Vitamin B6 works by improving the function of the synovium, the sheath that surrounds the tendons.” In addition, they explain how insulin resistance (elevated bloodglucose levels now at crisis proportions in the U.S. due to eating refined sugar and grains) causes reduced blood levels of B6 which then lowers both pancreatic and circulating insulin levels. Best known as pantothenic acid, vitamin B5 was discovered by Dr. Roger Williams who spearheaded the concept of biochemical individuality. It has long been considered the “antistress” vitamin for its role in helping to balance adrenal gland function and thus, helps us cope with stress better. In his book, “The Vitamin Revolution”, Revolution”, Michael Janson, M.D., says that insuffi cient amounts of pantothenic acid can lead to fatigue, mood imbalances and sleep concerns. Until now, only the inferior form of vitamin B5, d-calcium pantothenate, was available. Now, for the first time in history the superior end-chain form of B5 (coenzyme A) is available and the high powered derivative acetyl coenzyme A as well in a stable form all available in Max Stress B Nano-Plex. No other product on earth can directly deliver this form at any price. Vitamin B3 helps improve blood circulation by dilating arteries — especially important in the extremities and brain. This vitamin is a key factor in metabolizing carbohydrates, boosting energy and maintaining a healthy brain and nervous system. Vitamin B2 is important in the metabolism of carbohydrates, fat and protein and therefore, in creating energy. B2 also supports eye and skin health. The book, “The Natural Pharmacy”, points out that B2 also helps boost athletic performance, promotes brain health and assists in maintaining healthy, moist lips. Like B2, vitamin B1 is essential for metabolizing carbohydrates, fat and protein — and thus, boosting energy. It supports the nervous system and healthy emotional balance. Insufficient vitamin B1 can create a loss of appetite, memory and mood imbalances and sluggish thinking. Many studies show that B1 enhances the ability to learn and retain knowledge. Inositol is involved in immunity, liver function and cell membrane health. It promotes healthy liver metabolism, skin health and heart function, according to Dr. Berkson, author of “All About B Vitamins”. Inositol has been used by healthcare practitioners for severe mental imbalances. In 1998, for the first time, choline was classified as an essential B vitamin. Among many roles that it plays, choline is important for liver function, heart health, achieving optimal physical performance and healthy memory and mental balance. Even after biotin’s initial discovery, it took nearly 40 years of research for it to be fully recognized as a vitamin. Its roles include breaking down fats and creating new ones, constructing proteins from amino acids, and helping to manufacture various building blocks of genes. All together, the entire complex of Super Food B vitamins are present in Vitamin B Nano-Plex – naturally combined with powerful, synergistic co-factors and transporters – a truly 100% natural, whole-nutrient vitamin B complex supplement, delivering safe, proven support for energy, antistress, brain, heart, mood and immune health. Proprietary Blend: Primary Saccharomyces Cerevisiae, Bifidobacterium Species (breve ss. breve, infantis ss. infantis, longum), Enterococcus Species (faecalis TH10, faecium), Lactobacillus Species (acidophilus, bulgaricus, casei ss. casei, fermentum, helveticus ss. jagurti, plantarum), Streptococcus Therm. Recommended Use: Adults or children (age 4 and up): Take ¼ to ½ teaspoon (30 – 60 drops) mixed in ¼ cup water or juice, 2 times daily. Some people need one 1 teaspoon per day especially if you do not get 5 straight hours of sleep per night or you stress levels are high. 24-½ teaspoon servings per 2 oz. bottle. 47-1 teaspoon serving per 8oz bottle. To avoid detox symptoms start with a very low dose and work up to a full daily dose over one or two weeks. Our research shows an even better way of taking any of our liquid NANOs. Put your daily dose of all liquid Nanos into a 16 – 32oz bottle filled with filtered water mix and sip throughout the day away from food! Try to finish before 3pm. 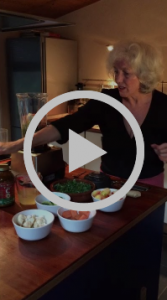 We highly recommend our Daily Powerhouse Health Cocktail! Powerful daily whole body support for exquisite health and recovery from illness. In a 1/2 cup of water (upon rising and 1 hour after dinner) mix in 30 – 40 drops (1/2 Tspoon) of each: Max Stress B, DHLA Nano-Detox and Super Nano Green Tea. Sip slowly. These three exceptional nutraceuticals are even more powerful when taken together. Premier Research Labs (Round Rock, Texas) Nutrition that Really Works. 1:) Broad Spectrum Nutrients: Every nutrient critical to great health is readily available and in sufficient amounts in our products. 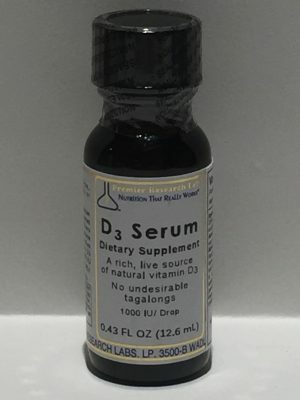 2:) Living Nutrients: The nutrients contained in our formulas are delivered as concentrates from “once” living sources to provide ideal cellular DNA repair and protection, simply not possible from old style, isolated vitamin and mineral properties. 3:) Free of Toxic Tag-alongs: PRL guarantees its cutting edge, phytonutrients power-house formulations are free of tpxic tag-along herbicides, insecticides, pesticides, heavy metals, fumigants, irradiation, etc. 4:) 100% Pure Vegetable Capsules: PRL’s products are made with 100% pure vegetable capsules, not as toxic tablets with liver toxic glues and binders or as gelatin capsules with the risk animal-source prions and toxic preservatives. PRL’s products are 100% excipient-free. They do not contain questionable or hard-to-digest, non-nutritive substances such as magnesium stearate (a toxic, hydrogenated oil), silicon dioxide (common sand), methylcellulose, carnuba wax, etc. PRL Nutraceutical Products are clinically proven to help the body overcome illness and improve health. PRL Products are certified organic, never irradiated. They contain no pesticides or toxic chemicals, and they utilize enzymatic processes for superior phytochemical availability. All PRL Quantum Rx capsules are 100% pure vegetable capsules (Vcaps) instead of tablets which are filled with glues and binders and hardened with heat and pressure or gelatin capsules that use toxic preservatives and are made from animal body parts, such as hooves, which can carry serious diseases. Our vegetable capsules are twice as well absorbed as a gelatin capsule and are free of toxic preservatives. Vcaps are considerably more expensive than gelatin capsules but they are worth the extra investment. PRL Nutraceuticals are also guaranteed free of milk, corn, soy, salt, sugar, wheat, yeast, artificial colors, flavors, preservatives, and stearic acid or magnesium stearate.